So I finally found my camera (yes, this is the 2nd time I lost it in my room lol) so that means more tutorials... YAY! I tried doing one today... it was one for that look I did when I went to MAC... for some reason I'm not really feeling it though... I don't know if it's just cuz I've been feeling 'ehh' lately or what. haha. OH!! and is anyone else pissed about how the Blond Brunette Redhead collection is coming out FRIDAY on the website while their damn sale ends on THURSDAY?! ARGHHH!! So freaking wack. Damn you MAC. lol. So why not do a tutorial? let's see the tut! 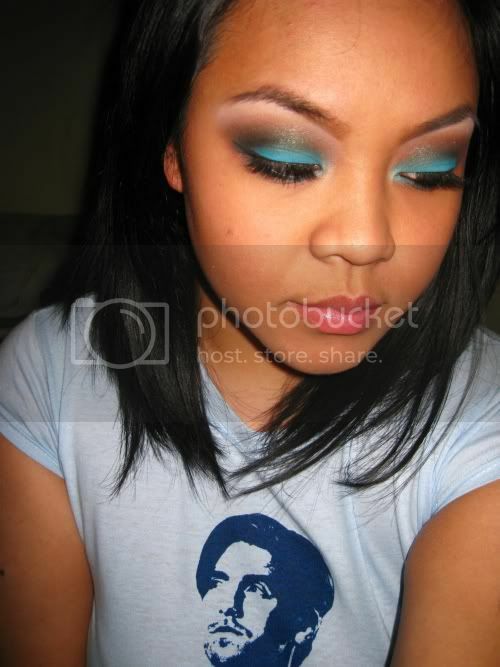 my boyfriend has been telling me ive been doing too many blue looks lately, i can't help it! 3-you should SOOOOO do the tutorial!!! I like! you should do a tut! Girl you are trippin' b/c this look is HOT. Yes, you need to do a tutorial. LOL. i forgot to mention that in my blog... whoops!